Chorley were just three minutes away from an apparently routine home win and another clean-sheet when a controversial penalty award by late-call-up referee Barry Lamb abruptly blunted the Magpies’ title-charge. There had been little sign of drama for two-thirds of this ultimately bizarre contest, as Chorley controlled much of the match, boosted by a stunning 25-yard volley on nine minutes by skipper Andy Teague. Josh Wilson twice was narrowly off-target with powerful snap-shots and with Jake Cottrell in his best harassing mood the visitors seldom got behind the Magpies’ solid defensive screen, though Matt Urwin did have to pull off a superb diving save midway through the second half from a well-struck free-kick. Bucks’ keeper Josef Bursik twice prevented Chorley from bagging a crucial second goal, spreading himself to block Marcus Carver’s shot when he was through on goal and also saving smartly at his near post from the influential Teague. For all their neat use of the ball in midfield, Telford did not look (set-pieces apart) to have a goal in their locker but the sending-off in the 73rd minute of the visitors’ Ellis Deeney - brother of Watford’s Troy - triggered a tempestuous, chaotic last act to the proceedings. Teague was at the centre of the controversy, when he looked to be harshly penalised for a challenge on Brendon Daniels right on the edge of the home penalty box. The referee initially awarded a free-kick but was persuaded to consult a linesman who had made his way along the by-line. The result – a penalty which, when order had finally been restored, Daniels himself confidently dispatched. The closing minutes had the crowd of 1,286 in a ferment as the Telford goal survived a couple of very close calls, not least when the referee penalised keeper Josef Bursik for holding onto the ball too long. The free-kick inside the box led to a shot being charged down with the defensive wall encroaching unchecked as the kick was taken. Then in the final seconds late Magpies’ substitute Shaun Tuton was presented with a golden chance to win it for Chorley – but sent clear on goal he failed to hit the target with only Bursik to beat, though the crowd behind the goal mistakenly thought the ball was in the back of the net! Both managers were distinctly unhappy with the officials’ performance. Bucks’ boss Gavin Cowan, who felt his side should have had a first-half penalty when Matt Urwin dived at Daniels’ feet, branded the referee ‘incompetent’. He said: "For these big games, you need a top referee. You can’t have important matches run by someone like this who was a let-down to both teams." 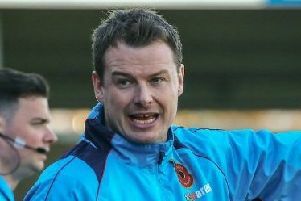 Chorley manager Jamie Vermiglio could not hide his own frustration. "I didn’t think Teague’s challenge was a foul in the first place. The referee has given a free-kick, then the linesman belatedly wades in and changes his mind for him. The Magpies’ pain in dropping two points so late in the game was eased after the final whistle with the news that Hereford, two down against Stockport, had hit back to equalise in added time, so the overall position at the top of the table remains unchanged with Chorley still two points ahead of Stockport who play their match in hand at in-form Chester on Tuesday. CHORLEY : Urwin, Challoner (Jordan,40, replaced by Tuton,87)), Blakeman, Teague, Leather, Mepen-Walter, Whitham, Cottrell, Carver, Wilson (Almond,80), E. Newby. Unused subs. McGurk, Hooper.